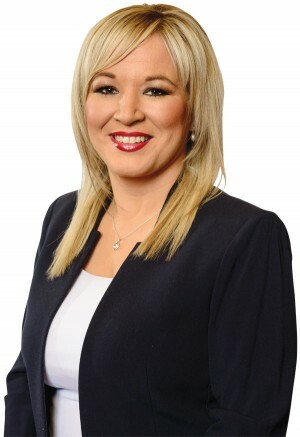 Michelle O’Neill is the Sinn Féin Assembly Member for the constituency of Mid-Ulster and Minister for Health. A formidable campaigner she has championed issues of equality, autism, disability, mental health and the rights of rural dwellers since first being elected as an Assembly Member in March 2007. Michelle served in local government as a member of Dungannon and South Tyrone Borough Council from 2005 until 2010 - becoming the first woman to hold the position of Mayor of the Dungannon council area. Following the 2011 Assembly Election Michelle was appointed as Minister for Agriculture and Rural Development. In this role Michelle successfully negotiated a new common agricultural policy programme securing the largest ever rural development programme to support farmers and those living in rural areas. She also strengthened all-Ireland agricultural links and delivered a rural needs bill to protect needs of rural dwellers. Michelle was the first Executive minister to decentralise an entire government department with the relocation of the DARD headquarters to Ballykelly in County Derry, Forest Service to Femanagh, Fisheries to south down and Rivers Agency Headquarters to Cookstown, creating 80 jobs in Mid Ulster. In May 2016 Michelle was re-elected as an Assembly member for Mid Ulster and reappointed to the Executive as Minister for Health. Since then she has established a clear vision for the future of health and social care through her 10 year transformation plan alongside prioritising mental health, focused on tackling health inequalities, early intervention and prevention. Michelle lives in Clonoe, County Tyrone and has two children. She has been active in republican politics since her youth and has held various senior positions within the Sinn Féin party. Michelle is a member of the Sinn Féin Ard Chomhairle. Previous to being elected to the Assembly, she worked in the Assembly from 1998-2005 as political advisor to former Assembly member Francie Molloy MP, before she entered local government politics herself. She is a keen supporter of Gaelic sports, and is a member of her local GAA club - Clonoe O'Rahilly's.